A well-worn copy of The Little Engine That Could rests on top of an antique upright piano in Amy Braun’s classroom at the Hancock Village School. It’s a fitting image for the oldest operating school in the United States, which is about to become the Little School That Couldn’t: The townspeople voted this spring to close the two-room schoolhouse, citing declining enrollment, increasing costs, and worries about inadequate socialization among its 22 students. Built in 1801, the Hancock Village School serves grades K-4. 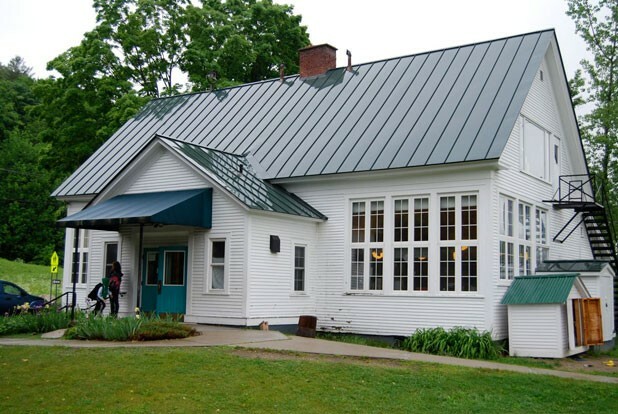 The district’s fifth- and sixth-graders go three miles up the road, to the Granville Schoolhouse, which is also dismissing its last class on Thursday afternoon. Once these two schools are shuttered, Elmore will be the only town in Vermont that educates its children in a schoolhouse setting. Some people — Commissioner of Education Armando Vilaseca among them — call that progress. They believe that Vermont has too many schools and too many teachers, and that education spending is out of control. Others see the current system as expensive but effective; Vermont consistently scores among the top five states on standardized reading and math tests. And while this so-called “school consolidation” debate has been raging for years, there has been little fundamental change in how education in Vermont is funded and delivered, until now. The tough economy is forcing towns to make hard choices — in the case of Hancock, between raising property taxes and dismantling schools. Braun thinks 65 of Hancock’s residents made the wrong call on May 7, when they voted to close this institution and effectively put her out of a job. But it’s not her career that concerns her; it’s the kids, the history of the building, and this small town of 305 souls. “You close a school and you cut off the lifeline of a community,” asserts Braun, who is a resident of nearby Rochester. Jim Leno, the chair of the Hancock selectboard, disagrees. “I personally don’t think a school makes a town,” he argues. “People make a town.” And if the townspeople want to close a school, he adds, then that’s their prerogative. Leno has been a proponent of closing the Hancock school for a number of years, “mainly because of costs,” he says. After three years of rising budgets, the 2009-10 numbers projected the expense of keeping the schools open — $773,188 — would exceed the cost of closing them and “tuitioning-out” Hancock students to surrounding schools, at $726,876. The difference between those options — about $45,000 — may not seem like a lot. But the federal government owns 82 percent of the land in Hancock, in the form of the Green Mountain National Forest, and all of that property is tax exempt. Last year the feds only contributed $28,000 to the town coffers. In the end, it would have cost each taxpayer in town an additional $600 a year to keep the old schoolhouse going. But the rationale behind Hancock’s decision was not completely financial, according to Dan Perera, the head of the Hancock school board. “One of questions the board was facing from parents was: ‘Are we providing enough stimuli for the kids if there’s one or two kids per grade?’” he says. Perera, who runs the Easy Street Café and Purple Moon Pub in Waitsfield, has a third-grader in the Hancock school. He believes the Village School District works. “But there has been this faction of people who wanted their kids tuitioned out, regardless of the finances,” he says. Leno is among them. He says he has fond memories of the six years he spent in the Hancock schoolhouse, but adds, “It was a hard adjustment for me to go from a small school setting to a larger school” for middle and high school. Parents in Granville, according to select board chair Vivian Branschofsky, expressed the same concerns about the extremely small class sizes. And small classes are the trend, at least in Vermont. The state has the lowest birth rate in the nation, and this marks the 13th consecutive year of decreasing student enrollments. Questions about the value and financial tenability of small schools aren’t likely to go away. The state government can’t seem to make up its mind on the issue. In 1998, a Department of Education report found that students in small schools do as well or better than their counterparts in larger schools. Towns with small schools, it revealed, often have no other place for the community to come together. It concluded that “small schools in Vermont cost more to operate than larger schools but they are worth the investment because of the value they add to student learning and community cohesion.” Based on that report, the state started a small-schools grant program for districts with average grade sizes of 20 students or less, or average enrollments of 100 or less. This year, the legislature renewed the program in its budget, allotting nearly $7 million from the education fund. Ultimately, the decision to consolidate schools still rests with the towns, and some have been creative in coming up with alternatives. In 2007, Barnard faced the same challenges as Hancock, but instead of closing the elementary school, the school board and the administration devised a plan to bring in more students. They adopted the Core Knowledge Curriculum, a program designed at the University of Virginia to teach cultural literacy, and then renamed their school the Barnard Academy. The school also added pre-K and made the kindergarten a full-day program. Over the past two years, enrollment has increased from 46 to 75. In Hancock, school’s out forever on June 18 — ending a 209-year run. Leno predicts the library and town clerk will take over the two soon-to-be-empty rooms. No one working in either of those offices will have any use for the old school bell perched high on the roof.